What 3 things would you take with you to an island? Hey dudes, hope you guys are fine. If not install this mod and take some vacations on a tropical island ;). Minecraft allows players to explore and build in a huge and expansive world. However, have you ever wanted to take a tropical vacation right in the game, without leaving the comfort of your desk? That is now possible with the Tropicraft Mod for Minecraft. This mod transforms the look at feel of the Minecraft world with a charming tropical resort theme. Let’s dive right in and see what this unique mod has to offer. Although Minecraft contains biomes that consist primary of sandy beaches and water, the Tropicraft Mod for Minecraft takes this theme a little further. Rather than cacti and forest trees, you will encounter palm trees. In an attractive touch of detail, these trees are adorned with coconuts that can be taken down and thrown around like snowballs and eggs could in the original version of Minecraft. Animals have been given a makeover, with such additions as seagulls, sting rays, alligators, turtles, tree frogs and swordfish. The “mobs” have been given a unique flair as well. 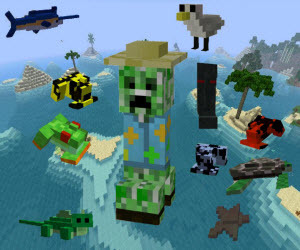 Even the familiar explosive monster, the “Creeper,” is wearing a festive Hawaiian shirt and sun hat. Plants have been replaced with colorful new equivalents that brighten up the game’s color scheme considerably. Aspects of Minecraft that were already tropical in nature, such as vivid amber sunsets and tropical rainstorms, have been made more frequent to fit with the theme. If you have ever lived in a tropical climate, you know that these are some of the most iconic and picturesque elements of those areas. Rather than barren deserts, players are treated to beautiful randomly generated atolls and islands that look like the perfect place to pitch a hammock and don a pair of sunglasses. The additions to the environment are subtle and yet rich with detail. The Tropicraft Mod for Minecraft is a virtual tropical getaway that is sure to please.